When Chanukah strolls around, if I can help it, I bake my potatoes latkes instead of, as traditionally done, frying them. 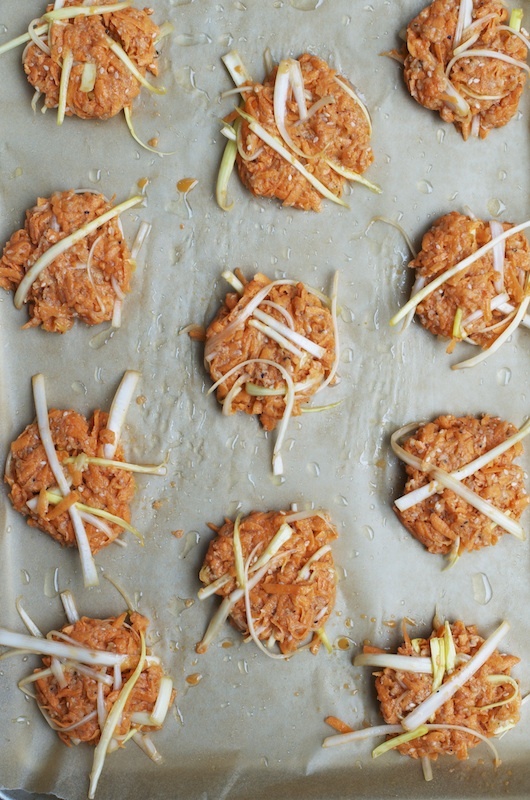 Indian inspired latkes won't taste the same baked, with the gluten free chickpea flour in it. So certain recipes I will still fry in a little oil to achieve the best results. More often than not baked will be, if not identical, pretty close, and with a lot less hassle involved. Rarely do I plan in advance when it comes to latkes. I typically use the veggies I have in my house and make a sensible combination of flavors. I had sesame leftover from a batch of Ka'ach I baked last night. I did not wish to add the leftover sesame seeds back into the spice jar, so I tossed them into the latkes. Somehow panko, sweet potatoes and sesame seeds, rang right. 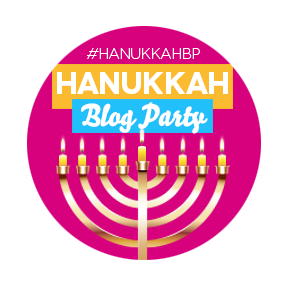 This post is part of a 1st annual Chanukah Blog Hop party hosted by Leah of Cook Kosher and Miriam of Overtime Cook. We've got a fabulous array of Chanukah themed recipes, treats and crafts from around the world. Scroll down to the links for all the delicious treats. Preheat oven to 400F. Brush 2 parchment paper lined cookie sheets with vegetable oil. Add all ingredients, other than oil for brushing, into a large bowl and mix well. Form 18 pancakes and lay on 2 paper line cookie trays. Bake on the middle rack of the oven for 30-40 minutes or until golden, flip with a spatula and continue baking at 400F for an additional 5 minutes or until golden on the flipped side. Serve with apple sauce, sour cream, pear cardamon sauce or any sauce of your choice. 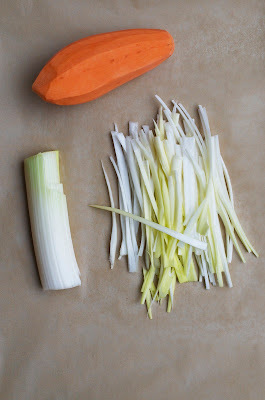 Cook's notes: You might wish to process sweet potatoes, onions and leek in a food processor for a rough or fine chop to save time. That will also make sure all ingredients cook at the same rate, as the leek, in strand form, might cook faster than the pancake itself. I personally like how the strands crisp up. Oh these latkes look wonderful, Shulie! I love sweet potatoes with leeks! Lovely links and wonderful latkes! A great idea. I love these Shulie! Wishing you and J a very Happy Hanukkah! I love fried laktes and haven't considered baking them. However these do tempt me to try! 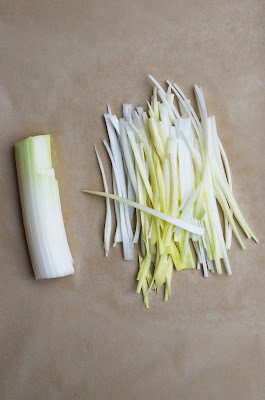 Gorgeous photos - love the use of leeks in this!! Love love how rustic these look! Now... this is how you make a latke. So pleased I discovered your blog via #hannukahbp. Hope you'll stop on over and say hi. I'll be looking for you on Facebook and Twitter. Love your approach here. Just a followup - are you on Twitter of FB? I couldn't find a link. TY so much for dropping by. Am sure to visit your site and check out your tasty recipes. Great blog hop introducing people to each other. My facebook http://www.facebook.com/pages/FoodWanderings/154585894570712?fref=ts and on twitter @doowanderings https://twitter.com/foodwanderings Thx again! Delish!!! Love the blog and these recipes! I love all the variations to the latke. I was thinking of coating my latke with panko for some extra crunch. I bet sweet potatoes and leeks go wonderfully together. Love your latke recipe, and what a great collection of Chanukah recipes to explore from all of the blogs! Love how creatively you have used those leek strings..and baked pancakes..Hmm..am gonna make it soon. I have to admit that I've never actually had a potato pancake... I'm loving the use of the sweet potato here, and the idea of baking. I think I'm inspired!! 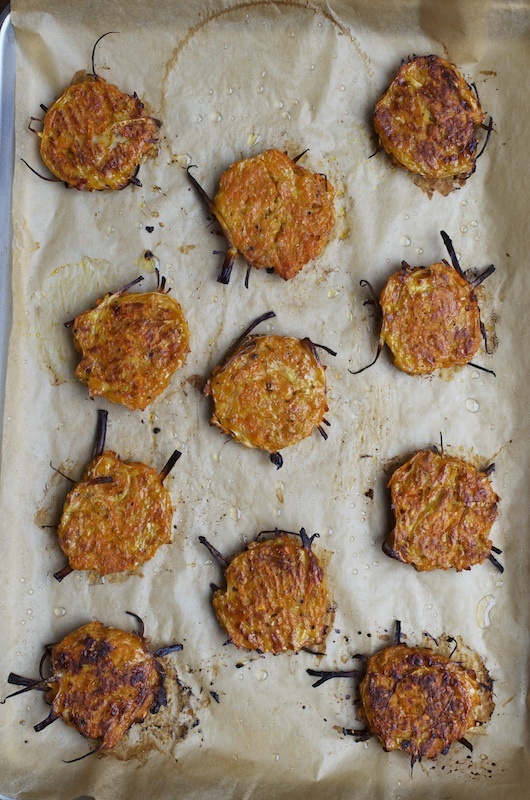 What gorgeous looking latkes! I love sweet potato and can't afford the calories of fried so this is a perfect recipe for me. Thanks for joining our party, Shulie! These look delicious! A wonderful hannukah to you and all your family. 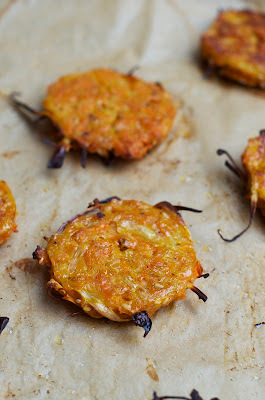 Sweet potato latkes...what a fabulous idea!! I love latkes, and I always look forward to all the recipes for them this time of year. Thank you for sharing something different...will be adding this to my latkes collection! Looks delicious, I definitely need to try it! I love leeks and potatoes! This combination is seriously my favorites! I cannot live with sweet potatoes and leeks especially winter months and Panko is my regular go-to ingredient too. This looks so delicious, Shulie! Happy Hanukkah! 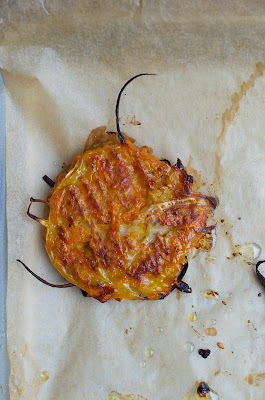 Just been craving sweet potato pancakes. Thanks for responding to the call. These look gorgeous. Happy Hanukkah! These are gorgeous Shulie. Love the addition of sweet potatoes. These look irresistible, Shulie! I have a feeling my picky family wouldn't have any trouble making these disappear! I really want to try your recipe, which will be a fun and healthy alternative to our typical Chanukah food indulgences. Not sure what is panko, and I probably can't anything like it where I live (in Israel), so what can be substituted? Hi Fonda, Panko is Japanese bread crumbs. You can find it in Israel. My sister uses them for making schnitzel. She buys them in a regular supermarket in Givatayim, Israel. 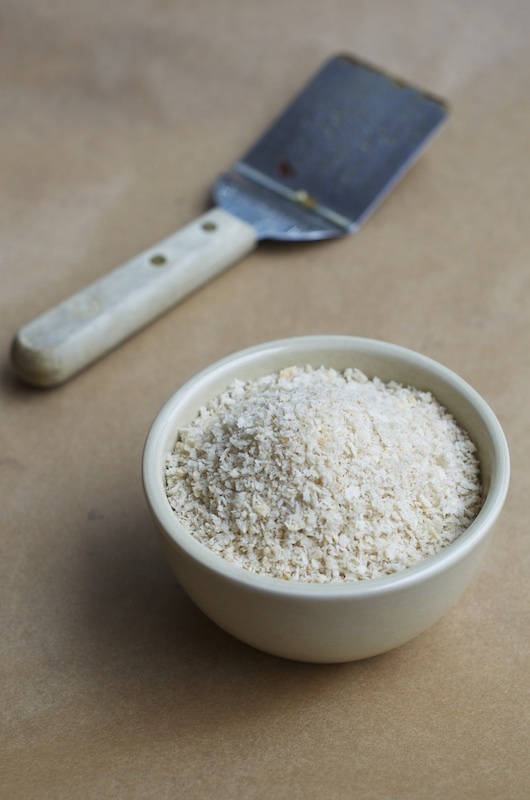 If you cannot find it, you can use regular bread crumbs.